Purpose: Monte Carlo simulation was carried out for a 6 MV flattening filter-free (FFF) indigenously developed linear accelerator (linac) using the BEAMnrc user-code of the EGSnrc code system. The model was benchmarked against the measurements. A Gaussian distributed electron beam of kinetic energy 6.2 MeV with full-width half maximum of 1 mm was used in this study. Methods: The simulation of indigenously developed linac unit has been carried out by using the Monte Carlo-based BEAMnrc user-code of the EGSnrc code system. Using the simulated model, depth and lateral dose profiles were studied using the DOSXYZnrc user-code. The calculated dose data were compared against the measurements using an RFA dosimertic system made by PTW, Germany (water tank MP3-M and 0.125 cm3 ion chamber). Results: The BEAMDP code was used to analyze photon fluence spectra, mean energy distribution, and electron contamination fluence spectra. Percentage depth dose (PDD) and beam profiles (along both X and Y directions) were calculated for the field sizes 5 cm × 5 cm - 25 cm × 25 cm. The dose difference between the calculated and measured PDD and profile values were under 1%, except for the penumbra region where the maximum deviation was found to be around 3%. Conclusions: A Monte Carlo model of indigenous FFF linac (6 MV) has been developed and benchmarked against the measured data. Conventional medical linear accelerators (linac) are equipped with a flattening filter (FF) which is primarily designed to produce a flat beam profile at a given depth by compensating for the nonuniformity of photon fluence across the field. However, FF decreases the output considerably and produces quality changes within the primary beam by scattering and absorption of primary photons. The requirement to have a flattened beam profile for treatment delivery is not necessary when a certain type of advanced modality treatments such as intensity-modulated radiation therapy (IMRT) or intensity-modulated arc therapies is used. In IMRT, the patient dose distribution can instead be shaped by the multileaf collimator (MLC) to create the desired clinical effect. In principle, the FF can be removed, and the leaf sequences can be adjusted accordingly to produce fluence distributions similar to those of a beam with an FF. The removal of FF with its associated attenuation from X-ray beam path increases dose rate. The other possible effect is substantial reduction in head scatter, as the FF is the major source of scattered photons. FF-free (FFF) beams in radiotherapy thus have the advantage of shorter treatment delivery time and lower out-of-field dose compared to conventional flattened beams. For small field sizes, unflattened fields have dose profiles similar to those of a flattened beam. This, along with the higher dose rate in FFF mode, will increase the efficiency when delivering stereotactic radiosurgery.,, For larger clinical targets, the desired photon fluence could be modulated using the MLC and movable jaws allowing FFF beams to be a useful approach for the delivery of radiotherapy treatments.,,,, Further, the vault design for FFF linac has shown lesser shielding requirements in comparison to FF linac. SAMEER (Society for Applied Microwave Electronics Engineering and Research), Mumbai, India has developed an indigenous linac unit named as “SIDDHARTH” which is capable of delivering cost-effective radiotherapy treatment in India. Presently, the linac unit is being used clinically at various hospitals in India in FF mode with photons of energies 4 and 6 MV. Recently, Subhalaxmi et al. have reported the dosimetric characteristics of this unit using Monte Carlo method as well as by measurement. However, due to the increase in interest of operating the linac in FFF mode, the feasibility study has been carried out for the same unit in FFF mode. The objective of this study is to evaluate the dosimetric characteristics of indigenously developed linac in FFF mode using Monte Carlo method and verify the results with the measured data. It may be noted that the measured data were generated in linac service mode to find the feasibility for clinical use of this linac in FFF mode. Monte Carlo method has become a powerful tool in radiotherapy dose calculations, and many studies have been performed using this method for studying beam characteristics of linac.,,,, Several Monte Carlo studies of FFF treatment machines have been published.,,,, In this study, Monte Carlo simulation of indigenously developed linac unit of photon energy 6 MV in FFF mode was carried out, and the data were verified with measurement for its clinical use. For this purpose, the user-codes BEAMnrc  DOSXYZnrc  of the EGSnrc code system  were used to study its dosimetric characteristics. The calculated dose data were then compared with the measured data. The BEAMDP  (BEAM Data Processor) user-code of the EGSnrc code system was used to analyze the phase-space files and to extract the spectra of particles such as photons and electrons reaching the plane at the source to surface distance (SSD) of 100 cm. 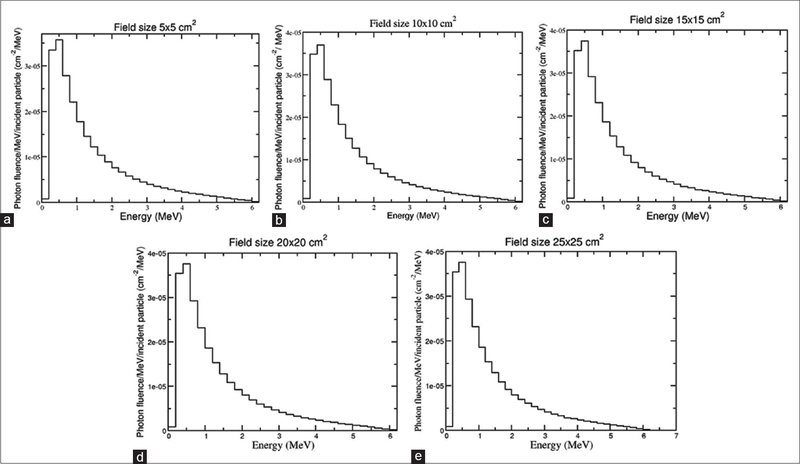 This study reports the percentage depth dose (PDD), TPR 20/10, beam profiles, surface dose, build-up dose, mean energy, photon fluence, and contaminant electron fluence spectra for the 6 MV FFF beam. The geometry of indigenously developed linac was simulated using the BEAMnrc  user-code of EGSnrc  code system based on the detailed design specification provided by the vendor. Different components of the linac head such as target, primary collimator, monitor chamber, and secondary collimator were accurately modeled. [Figure 1] shows the linac modeled in the present study. In this simulation, Z-axis is taken along the beam axis, and the origin is taken at the front face of the target. In the Monte Carlo simulations, a mono-energetic electron beam of kinetic energy 6.2 MeV with a Gaussian distribution of full width half maximum 0.1 cm was incident on the target. This optimized energy of 6.2 MeV was selected from the previous research of Subhalaxmi et al. Phase space data were scored at a distance of 100 cm SSD for all the treatment field sizes ranging from 5 cm × 5 cm to 25 cm × 25 cm in an increment of 5 cm2. The phase space file contains information about the simulated particles (energy, position, and direction). The electron transport cutoff (ECUT) and photon transport cutoff (PCUT) energy were set to 0.7 and 0.01 MeV, respectively. No photon interaction forcing was used. As described in the published literature, range rejection was turned on with ESAVE value of 0.7 MeV in the target and 2 MeV in the other part of the linear accelerator geometries as they do not contribute significantly and this helps in optimizing the computational time. The PEGS4 data set needed for the simulations was based on the state-of-art XCOM compilation. The number of particles histories simulated in the Monte Carlo calculation was 6 × 109. The phase space data from the aforementioned simulations served as the source for the simulation using the DOSXYZnrc user-code of EGSnrc code system. DOSXYZnrc is capable of 3D absorbed dose calculations in Cartesian coordinates in the water phantom. In DOSXYZnrc, the water phantom size was 50 cm × 50 cm × 50 cm and the phase space source position was on the water surface, i.e., at Z = 100 cm. The phantom was divided into a number of voxels. The voxel dimensions were different in different dose gradient regions of the water phantom. The voxel dimensions were adapted to be small in regions of high dose gradients and vice versa. 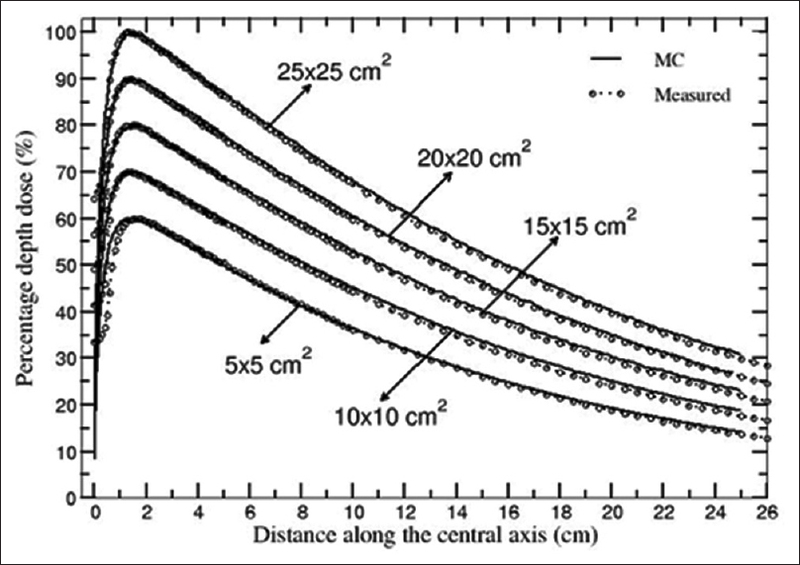 For central axis PDD simulation, up to a depth of 2 cm, absorbed dose was scored in voxel dimension of 1.0 cm × 1.0 cm × 0.05 cm and for depths from 2 cm to 25 cm, voxel dimension of 1.0 cm × 1.0 cm × 0.1 cm was considered. The beam profiles (both X and Y directions) were calculated at three different depths such as depth of maximum dose (1.5 cm), 5 cm, and 10 cm. For beam profile simulations, different voxel dimensions were chosen for the shoulder, penumbra, and unflat regions. For example, for dose profile simulation in X-direction for a field size of 10 cm × 10 cm, voxel dimensions of 0.1 cm × 1.0 cm × 0.1 cm (from −4.0 to +4.0) for unflat region and 0.05 cm × 1.0 cm × 0.1 cm for shoulder and penumbra regions (from −7.5 to −4.0 to +7.5 to +4.0) were used. The PEGS4 data set needed for the simulations was based on the state-of-art XCOM compilation. The parameters set for DOSXYZnrc simulation were, ECUT = AE = 0.521 MeV, and PCUT = AP = 0.01 MeV. PRESTA-II electron-step algorithm was used in all simulations. The total number of histories set in the calculation was 6 × 109. The 1 σ statistical uncertainty on the dose estimates were <0.8%. PDD and beam profile measurements were carried out in the service mode of the linac (as FFF beam is under investigation before its clinical implementation) using PTW, Germany, make RFA dosimetric system (water tank MP3-M and 0.125 cm3 ion chamber). The measurements were performed with 1 mm resolution for PDD curves, beam profiles, and TPR 20/10. Field sizes considered were from 5 cm × 5 cm to 30 cm × 30 cm at SSD of 100 cm. Beam profiles were measured at three different depths, i.e., depth of maximum dose (dmax), 5 cm and 10 cm for both X and Y directions. The BEAMDP code was used to analyze the phase-space files, extract the various types of spectra of all particles reaching the plane at SSD 100 cm and to determine the photon fluence spectra, mean energy distribution, and electron contamination fluence spectra. Photons emerging from the target passes through the primary collimator and other components of the collimating system on their way to the scoring plane at SSD 100 cm. [Figure 2] shows on-axis photon fluence spectra calculated at the scoring plane for different field sizes. Scoring plane is an annular region of 2.5 cm radius around the central axis. Secondary electrons generated from different components of the linac head and also by the primary photons inside the phantom are the sources of contaminant electrons. [Figure 3] shows the calculated contaminant electron fluence spectra along the central axis for all the investigated field sizes. The contaminant electron fluence spectra were scored in an annular region of radius 2.5 cm around the central axis. It is observed that the number of electrons reaching the phantom surface strongly depends on the field size and increases with increase in field size. The mean electron fluence for field size 20 cm × 20 cm was found to be 1.8 times higher than that for 10 cm × 10 cm and 3.6 times for 5 cm × 5 cm field size. The fluence-weighted mean energies were calculated for field sizes of 5 cm × 5 cm, 10 cm × 10 cm, 15 cm × 15 cm, 20 cm × 20 cm, 25 cm × 25 cm and summarized in [Table 1]. The mean energy of photon decreases with the increasing field size due to the increased contribution of more low-energy scattered photons from the linac head. PDDs were calculated for depths from 0 cm to 25 cm for the field sizes 5 cm × 5 cm, 10 cm × 10 cm, 15 cm × 15 cm, 20 cm × 20 cm, and 25 cm × 25 cm. Both the calculated and measured central axis depth-dose curves were normalized to the value of maximum dose for the respective field size on the central axis and then compared. [Figure 4] shows the comparison between the calculated and measured PDDs for all the field sizes studied in this work. The dose difference between the calculated and measured PDD values was under 1% for all the investigated field sizes. The differences between calculated and measured values were <1% in the tail region and <0.5% in the superficial depth region for all the investigated field sizes. The measured dmax occurred at 1.4 cm for all the investigated sizes except 5 cm × 5 cm for which it occurred at 1.6 cm. The Monte Carlo calculated dmax occurred at about 1.5 cm for all the investigated field sizes. Dmax was mostly constant with increase in field size for FFF beams. The measured and calculated PDD value at a depth of 10 cm for a field size of 10 cm × 10 cm is about 64% which is comparable to the literature quoted value of 63.4% by Vassiliev et al. and Ankit et al. for an FFF 6 MV Varian Clinac 21EX. An energy parameter value for comparison purposes was obtained using a TPR 20/10 ratio. The TPR 20/10 value was determined from the calculated PDD values at 20 cm and 10 cm using an empirical approximation relation  (TPR 20/10 = 1.2661 PDD 20/10-0.0595), where PDD 20/10 is the ratio of PDD at 20 cm to the PDD at 10 cm depth. The calculated TPR 20/10 value was found to be 0.638 which is in close agreement with the measured TPR 20/10 value of 0.634. Surface dose or skin dose is the dose calculated at the entrance of the phantom. The surface dose for any field size is defined as the dose measured at the surface for that field size divided by the dose at dmax for a 10 cm × 10 cm field size. The region between the surface and the point of maximum dose is called the build-up dose region. Both surface dose and build-up region doses are affected by variation in field size. Surface dose increases with increase in field size. [Table 1] shows the variation of Monte Carlo calculated surface dose with field size. For the first 10 mm build-up depths, the dose increased from 55.7% to 95.1%, 59% to 98.3%, 61.5% to 98.4%, 62.9% to 98% and 64.2% to 98% for the field sizes 5 cm × 5 cm, 10 cm × 10 cm, 15 cm × 15 cm, 20 cm × 20 cm, and 25 cm × 25 cm, respectively. The maximum difference was observed for smaller field size, and the difference reduced with increase in field size. The surface dose for a field size of 10 cm × 10 cm is 59% which is comparable to the literature quoted value of 56.2% by Ankit et al. The beam profiles (both X and Y directions) were calculated at three different depths of dmax (1.5 cm), 5 cm and 10 cm for the above field sizes. All the beam profiles were normalized to their central axis value. As there is symmetry between X and Y profiles, only X profile is presented. [Figure 5] shows the comparison of Monte Carlo calculated and measured beam profiles obtained at 100 cm SSD for the investigated field sizes at depths of dmax and 10 cm inside the water phantom in X direction. The agreement between calculated and measured dose values was within 1%, except for the penumbra region where the maximum deviation was about 2.6%. At the dmax, the agreement between the calculations and measurements is about 2% in the unflat region and about 3% in the penumbra region. In this study, a Monte Carlo model of indigenous FFF linac (6 MV) has been developed using the Monte Carlo-based BEAMnrc user-code of the EGSnrc Monte Carlo code system. The dosimetric parameters such as PDD and beam profile were calculated using DOSXYZnrc user-code. This Monte Carlo model was benchmarked against the measured data. The differences between calculated and measured PDD values were <1% in the tail region and <0.5% in the superficial depth region for all the investigated field sizes. The dmax occurred at 1.5 cm and mostly remained constant with field size. Surface dose and build-up region doses vary with field size. Surface doses increased with increase in field size. Results indicate good agreement between Monte Carlo calculated and measured lateral beam profiles (X and Y) obtained at SSD = 100 cm for all the investigated field sizes at depths of dmax, 5 cm and 10 cm. The difference between calculated and measured dose values were <1%, except for the penumbra region where the maximum deviation between calculated and measured dose values were found to be around 3% (at depth dmax). Phase space files were analyzed using BEAMDP user-code of EGSnrc code system. The authors would like to thank Dr. P. K. DashSharma, Head, Radiological Safety Division, Atomic Energy Regulatory Board, and Dr. D. Datta, Head, Radiological Physics and Advisory Division, Bhabha Atomic Research Centre, Mumbai, India, for their encouragement and support throughout the study. The authors would also like to thank Shri J. D. Abhayankar, Program Director, SAMEER Mumbai, India, for his technical support in the study. Mesbahi A, Nejad FS. Monte Carlo study on a flattening filter-free 18-MV photon beam of a medical linear accelerator. Radiat Med 2008;26:331-6. Vassiliev ON, Titt U, Pönisch F, Kry SF, Mohan R, Gillin MT, et al. Dosimetric properties of photon beams from a flattening filter free clinical accelerator. Phys Med Biol 2006;51:1907-17. Zhang G, Javedan K, Moros E, Latifi K, Feygelman V, Moffitt HL, et al. SU-E-T-479: Skin dose from flattening filter free beams: A Monte Carlo investigation. Med Phys 2012;39:3815. Fu W, Dai J, Hu Y, Han D, Song Y. Delivery time comparison for intensity-modulated radiation therapy with/without flattening filter: A planning study. Phys Med Biol 2004;49:1535-47. Gillies BA, O'Brien PF, McVittie R, McParland C, Easton H. Engineering modifications for dynamic stereotactically assisted radiotherapy. Med Phys 1993;20:1491-5. O'Brien PF, Gillies BA, Schwartz M, Young C, Davey P. Radiosurgery with unflattened 6-MV photon beams. Med Phys 1991;18:519-21. Vassiliev ON, Kry SF, Kuban DA, Salehpour M, Mohan R, Titt U, et al. Treatment-planning study of prostate cancer intensity-modulated radiotherapy with a varian clinac operated without a flattening filter. Int J Radiat Oncol Biol Phys 2007;68:1567-71. Kry SF, Vassiliev ON, Mohan R. Out-of-field photon dose following removal of the flattening filter from a medical accelerator. Phys Med Biol 2010;55:2155-66. Mesbahi A, Mehnati P, Keshtkar A, Farajollahi A. Dosimetric properties of a flattening filter-free 6-MV photon beam: A Monte Carlo study. Radiat Med 2007;25:315-24. Vassiliev ON, Titt U, Kry SF, Pönisch F, Gillin MT, Mohan R, et al. Monte Carlo study of photon fields from a flattening filter-free clinical accelerator. Med Phys 2006;33:820-7. Mishra B, Selvam TP, Sharma PK. Structural shielding design of a 6 MV flattening filter free linear accelerator: Indian scenario. J Med Phys 2017;42:18-24. Subhalaxmi M, Dixit PK, Selvam TP, Yavalkar SS, Deshpande DD. Monte Carlo investigation of photon beam characteristics and its variation with incident electron beam parameters for indigenous medical linear accelerator. J Med Phys 2018;43:1-8. Sheikh-Bagheri D, Rogers DW. Monte Carlo calculation of nine megavoltage photon beam spectra using the BEAM code. Med Phys 2002;29:391-402. Mesbahi A, Reilly AJ, Thwaites DI. Development and commissioning of a Monte Carlo photon beam model for Varian Clinac 2100EX linear accelerator. Appl Radiat Isot 2006;64:656-62. Das IJ, Kassaee A, Verhaegen F, Moskvin V. Interface dosimetry: measurement and Monte Carlo simulations of low-energy photon beams. Radiat Phys Chem 2001;61:593-5. Sheikh-Bagheri D, Rogers DW, Ross CK, Seuntjens JP. Comparison of measured and Monte Carlo calculated dose distributions from the NRC linac. Med Phys 2000;27:2256-66. Ankit K, Neeraj S, Shiru S, Pradhan S, Mandal A, Aggarwal LM. Monte Carlo study of a flattening filter-free 6 MV photon beam using the BEAMnrc code. Biomed Res 2017;28:1566-73. Sangeetha S, Surekha CS. Comparison of flattening filter (FF) and flattening-filter-free (FFF) 6 MV photon beam characteristics for small field dosimetry using EGSnrc Monte Carlo code. Radiat Phys Chem 2017;135:63-75. Dalaryd M, Kragl G, Ceberg C, Georg D, McClean B, af Wetterstedt S, et al. 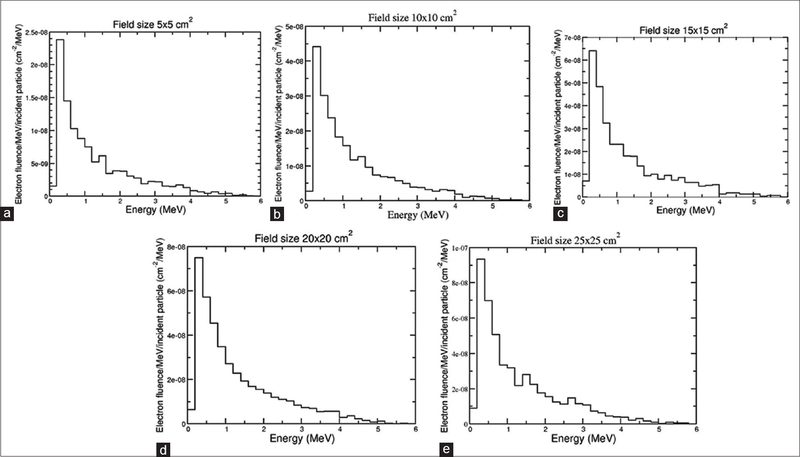 A Monte Carlo study of a flattening filter-free linear accelerator verified with measurements. Phys Med Biol 2010;55:7333-44. Feng Z, Haizhen Y, Yibao Z, Wu H, Cheng J, Su X. Monte Carlo simulation of beam characteristics from small fields based on TrueBeam flattening-filter-free mode. Rad Oncol 2016;11:2-9. Tsiamas P, Sajo E, Cifter F, Theodorou K, Kappas C, Makrigiorgos M, et al. Beam quality and dose perturbation of 6 MV flattening-filter-free linac. Phys Med 2014;30:47-56. 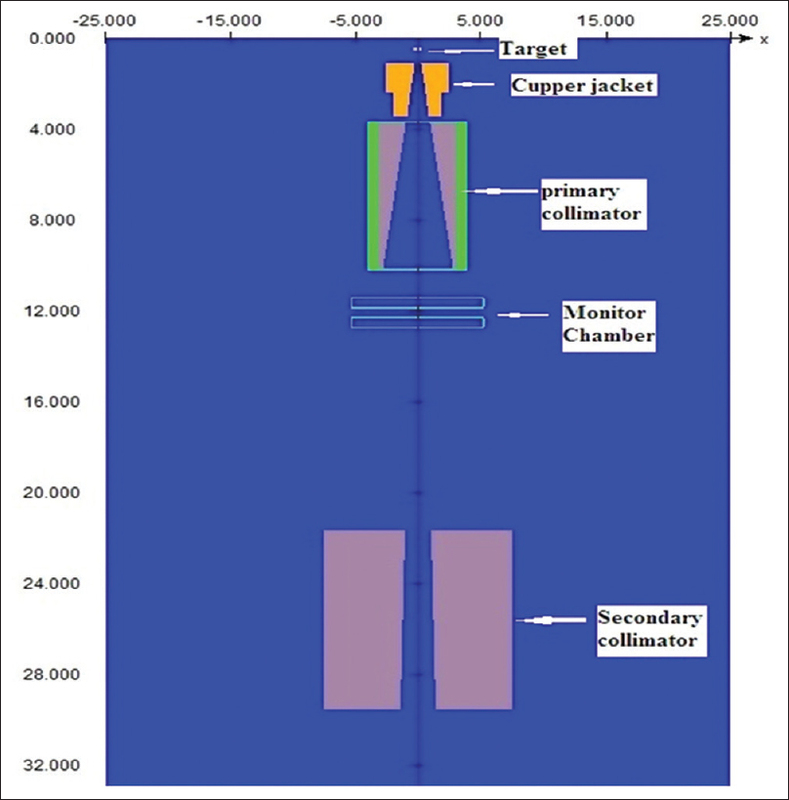 Shimozato T, Aoyama Y, Matsunaga T, Tabushi K. Beam characterization of 10-MV photon beam from medical linear accelerator without flattening filter. J Med Phys 2017;42:65-71. Rogers DW, Walters B, Kawrakow I. BEAMnrc Users Manual. PIRS 509(A) Rev. Ottawa, ON: National Research Council of Canada; 2016. Walters B, Kawrakow I, Rogers DW. DOSXYZnrc Users Manual. PIRS 794(B) Rev. Ottawa, ON: National Research Council of Canada; 2016. Rogers DW, Kawrakow I, Seuntjens JP, Walters BR, Mainegra-Hing E. NRC User Codes for EGSnrc. NRCC Report PIRS-702 (Revb). Ottawa, ON: National Research Council of Canada; 2010. Ma CM, Rogers DW. BEAMDP as a General-Purpose Utility. National Research Council Report. PIRS 509e Rev A. Ottawa, ON: National Research Council of Canada 2004. M Berger MJ, Hubbell JH. XCOM, Photon Cross Sections on a Personal Computer. Gaithersburg, MD: National Institute of Standards and Technology; 1987. Available from: http://www.physics.nist.gov/PhysRefData/Xcom/html/xcom1.html. [Last accessed on 2016 May 26]. Followill DS, Tailor RC, Tello VM, Hanson WF. An empirical relationship for determining photon beam quality in TG-21 from a ratio of percent depth doses. Med Phys 1998;25:1202-5.